BM-1000/C on finals at Delhi - Palam - VIDP, India. • 3688 Royal Canadian Air Force. Delivered 30-Nov-1954. • BM-1000 Donated to Indian Air Force. Mar-1963. Withdrawn from use in Aug-1981 and put on display at Delhi-Palam Air Base. Otter 55 was delivered to the RCAF on 30th November 1954 with serial 3688. It was delivered to No.6 Repair Depot, Trenton and put into storage as a reserve aircraft, returning to DHC at Downsview in January 1956 for incorporation of All Up Weight modifications. Upon completion of the work in July 1956 it took a trip to the Canadian National Exhibition Centre in Toronto, where it was on display as part of a recruiting campaign. It then went back to DHC who prepared it for assignment to 105 Communications & Rescue Flight at Namao Air Base, Alberta, which it joined later that month of July 1956. With the unit it served alongside Otter 3691 and several C-47 Dakotas. During March 1957 it deployed north to Whitehorse in the Yukon together with C-47s 587 and 971 and took part in an extensive search for a missing Okanagan Helicopters Bell 47 CF-FDN, flying alongside the Whitehorse Station Flight Otter 3689. It is mentioned in the Unit's diary taking part in 'SAR Koessler' on 22nd September '57, searching for missing aircraft N3151C, alongside Otter 3691 and Dakotas 224 and 971, all of 105 C&R Flight. The two Otters were dispatched by Vancouver Rescue Co- Ordination Centre to carry out a track crawl along the route Bear Lake - King Mountain - Dease Lake. The aircraft was spotted on King Mountain Lake and the survivors at Dease Lake, from where they were evacuated by 3691. During October 1957 the Alberta Department of Public Health requested an aircraft to take nurses to Loon Lake, where a whooping couch epidemic had broken out. Between 3rd and 10th October, Otter 3688 shuttled between Peace River, Seba Beach and Loon Lake with the nurses and serum. On 18th November '57 3688 became overdue on a flight from Namao to Horshoe Lake, but eventually arrived safely. It again experienced communications difficulties on 6th February '58 on a flight from Namao to Wainright. The next day it took part in 'SAR Hicks', the search for Cessna 195 CF-JVQ missing on a flight from Snowdrift, on the east side of Great Slave Lake to Campbell Lake, seventy miles northwest of Fort Reliance. The missing Cessna was located by Dakota 224 and Otter 3688 picked up the survivors and flew them to Yellowknife. The following month, March 1958, 3688 left 105 C&R Flight and was flown to the Canadian Pacific Airlines depot at Lincoln Park, Calgary where it was stored as a reserve aircraft until October 1958, when it arrived at the Cold Lake Station Flight, Alberta on amphibious floats. It had a somewhat eventful training detail on 24th July 1959, sustaining three fairly heavy landings on water and a fourth on the runway. The fuselage was found to be buckled in an area recognised by the manufacturers as weak. The damage was repaired. 3688 continued serving the Cold Lake Station Flight until June 1962, when it went back to No.6 Repair Depot, Trenton, into storage again. The following year it was one of five Otters selected by the Canadian government to be donated to India. In March 1963 the five were removed from storage, and sent to DHC at Downsview for packaging and shipment to India. 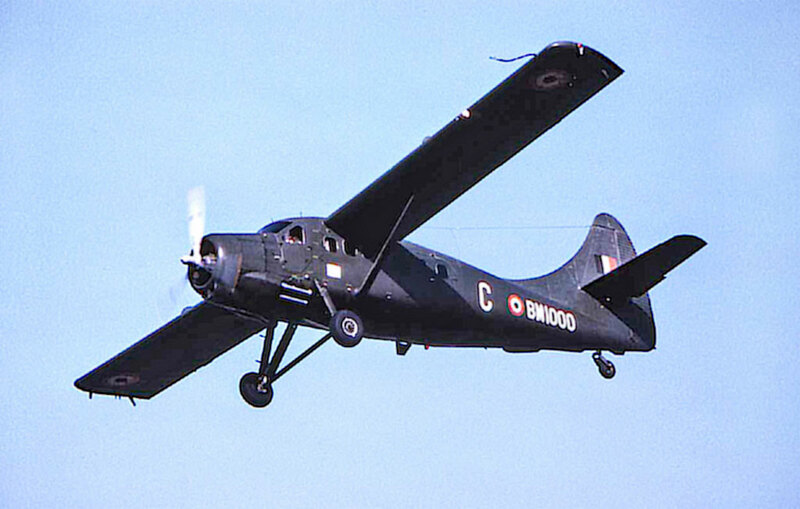 On arrival in India the Otter joined the Indian Air Force, with serial BM-1000. It served for the next 18 years until withdrawn from use in August 1981 and put on display at Delhi-Palam Air Base. It had served with 41 Squadron at Palam since 1976, coded C.